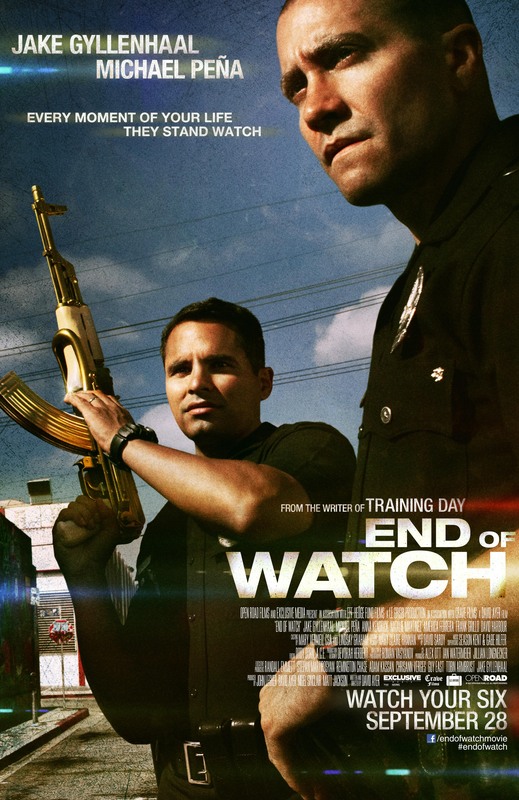 Synopsis: Taylor (Gyllenhaal) and Zavala (Peña) are partners on a South Central squad of the LAPD. After pulling over a person of interest, they discover a Mexican gang might be into running drugs and more for a Mexican cartel. When they can't let their personal investigation go, they wind up getting on the cartel's bad side. Andrew: Hello readers! Sarah and I hit up our local theatre for the second night in a row, this time to catch this past weekend’s new R-rated cop drama End of Watch. It stars Jake Gyllenhaal and Michael Peña as partners on the South Central beat for the LAPD and is written and directed by David Ayers who wrote Training Day and S.W.A.T., so we know Ayers is familiar with this genre. This is a film that I personally was looking forward to because of Ayers’ pedigree, because of the lead actors and because the trailers made it look like it was going to be a damn good cop drama. I’m not sure what your thoughts were going in because we weren’t able to do a weekly preview, so what were your thoughts going in to End of Watch? Sarah: I didn’t have high hopes for this one going in. I don’t think Jake Gyllenhaal is a great actor, I think he does well in the roles that he’s picked for, but he does seem to fit well in the military or police officer role pretty well. So I’ll give him that. Other than that I didn’t have high expectations. I haven’t really liked Michael Peña that much since Crash, which I think was an amazing role, but I have to say that I was very impressed with End of Watch. End of Watch is the best buddy cop comedy we've seen since the Lethal Weapon films. No, seriously. It is. S: But pretty seamlessly. It doesn’t cut from footage camera to a studio camera or anything, it’s still hand-held the entire time, which I liked. The one thing I will complain about is I wish they had gone further with the point-of-view aspect because they set it up as Gyllenhaal’s Taylor is filming their exploits for a college film class but nothing really ever comes of that. A: It’s a device, nothing more, though I agree I would have liked to have seen them come back to that later. That said, you said you liked the movie? S: Yeah, I liked the grittiness of it. I loved the action, which was pretty awesome. It wasn’t what I was expecting; I didn’t expect it to be as violent as it is at times. It’s very much a gritty cop movie, moreso than we've seen in a while. S: Yeah, this is more like Bad Boys but grittier and more realistic. A: But what I liked about End of Watch – and let me state this first, I loved this movie. I absolutely loved it. And the reason I loved it is because I loved the chemistry that Gyllenhaal and Peña had. A: Gyllenhaal’s Taylor and Peña’s Zavala are truly brothers. Not just in arms, but they are the true definition of "brother from another mother." They’d literally take a bullet for one another, but it’s also their comedic timing and personal chemistry. There were MANY times where we laughed out loud in this movie. This is actually one of the funniest movies I think we’ve seen this year, and it was totally intentional because of their interactions. And also the action and tense scenes in the film where they’re working their police beat…I just think that Gyllenhaal and Peña were inspired casting because they worked so well with one another. I could have watched their characters for hours. There are many scenes with just Gyllenhaal's Taylor and Peña's Zavala riding around just talking and joking around that had us in stitches, a testament to their natural chemistry. S: And their counterparts, their wives were also great! I felt that Gyllenhaal and Anna Kendrick had great chemistry on-screen. There have been a few films where we've seen Kendrick where she’s had chemistry with her other leads but not like this, in my opinion. I think she stepped it up a bit in this film, particularly playing the wife role. A: She did, but she’s also pretty young so I don’t think we’re going to see her in that role very often just yet. But she did work really well with Gyllenhaal and she’s actually not in the movie a whole lot but she has a couple of scenes I absolutely loved - one where her character, Janet, takes Taylor's camera while he's sleeping, jokes around a bit about looking through his wallet and basically, very sweetly says she's sticking around for the long haul, and another where she and Gyllenhaal are rapping in a car that was funny and sweet. Her chemistry with Gyllenhaal came off as very genuine. Which brings me to a bigger point I loved about End of Watch. What the actors were able to portray, and credit to them but also to the filmmakers, was incredibly genuine. I felt like we were watching actual people. For the most part none of it felt fake, except for my one criticism of the movie: the cartel gang members. They were god-awful and felt very forced. I wish they hadn’t shown them so much. S: I didn’t understand, because their scenes were also found-footage kind of stuff too, so why the hell were they filming each other to begin with? I didn’t get that. Wasn’t impressed with them, they didn’t seem genuine. A: You know, I feel like Ayers could have just gone with a hand-held camera for the whole thing instead of doing point-of-view or found footage stuff, because sometimes it worked, sometimes it didn’t. S: Yeah, and you know I didn’t like Cody Horn very much in Magic Mike but I really liked her here. She plays a cop very well. They both did. America Ferrera, like, who knew? Ugly Betty? In a gritty cop film where she plays a lesbian? Nice! A: We also had a familiar face from one of our favorite movies, Frank Grillo (Warrior), who plays Taylor and Zavala’s sergeant. He had some nice scenes and I bought him as an LAPD sergeant. S: And who was the other guy who played Officer Van Hauser? A: That was David Harbour, who plays Elliot on HBO’s The Newsroom. S: Yes! He did a really good job, too. A: So all around the casting is pretty fantastic. I can’t say enough about it. But yes, the movie as a whole is gritty, it’s pretty violent, but the tense parts actually got my heart-pounding there. Scenes where Taylor and Zavala are searching houses in South Central are actually pretty intense. S: Oh for sure. When they’re searching through houses or in car chases, it’s an exciting movie! A: Just the action beats were fantastic. Overall, I loved it. Again, Gyllenhaal and Peña were the main thing I loved. Their relationship on-screen was so good that Zavala’s toast at Taylor’s wedding actually had me tearing up a bit because it felt so real. A: And I would personally like to own this one someday. A: This has re-watchability written all over it. S: And that’s one of the things I noticed about this film that I haven’t noticed with a lot of other films we’ve seen recently, how often we’d want to re-watch them. A: Overall then we give this our highest recommendation by saying we’ll buy it some day, and definitely go see it if you’re into action-packed films or just to see the Gyllenhaal and Peña rock it out.